With a focus on blending the traditions of the deli with the principles and practices of halal food preparation, Deli Halal is taking the lead in bringing halal food to mainstream markets! 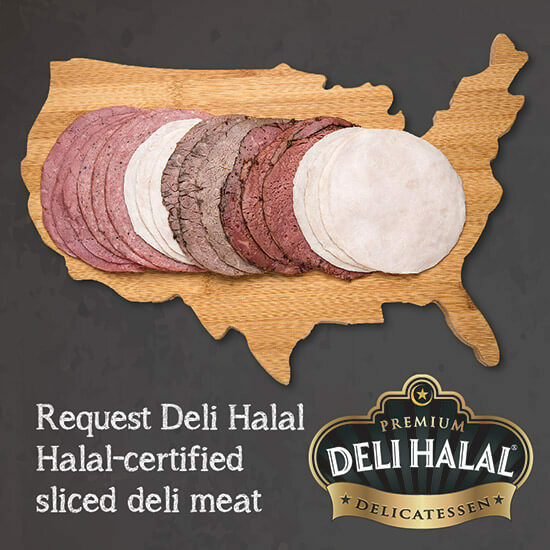 Deli Halal produces a line of premium-quality, halal-certified sliced deli meats for those who have a passion and hunger for quality halal products made with pride in the U.S.A. Deli Halal deli meats are prepared to perfection: seasoned, sliced, certified-halal, and made available in your deli section—never frozen. Additionally, all Deli Halal products are humanely raised and harvested, kept free from contaminants, and never fed animal byproducts. All Deli Halal meat and cheese products are USDA-inspected and certified halal by Halal Transactions of Omaha (HTO). For all inquiries regarding our halal certification perimeters, please feel free to contact HTO directly. Deli Halal is Excited to Help #SpreadTheHalal! 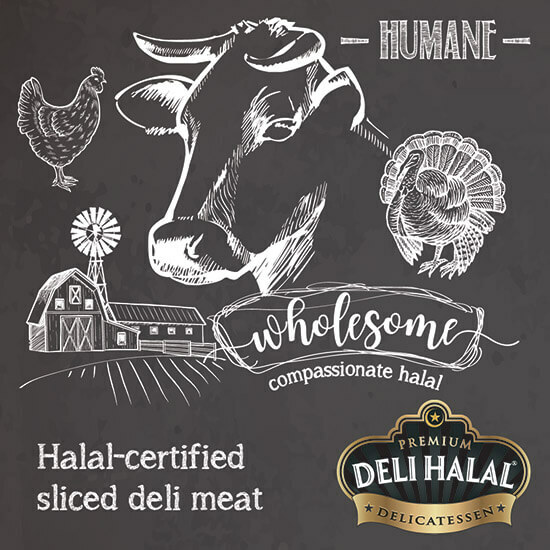 Deli Halal has teamed up with My Halal Kitchen to help spread the word about our high-quality halal-certified deli products and educate consumers about the wholesome benefits of halal food. 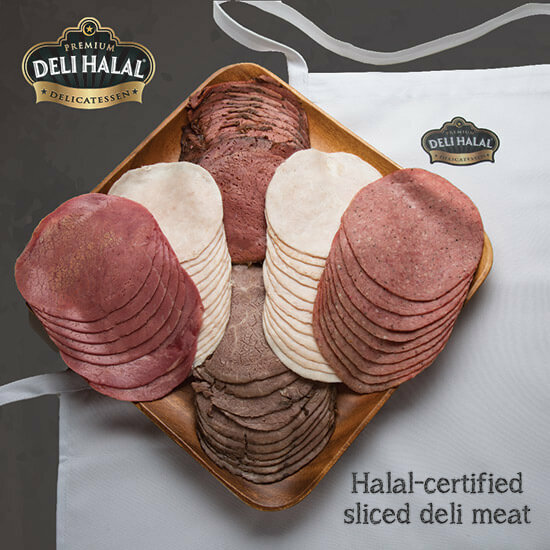 Halal Transactions of Omaha provides vital third-party oversight to help ensure that all of Deli Halal’s sliced meats and cheeses comply with the most rigorous of halal standards. Working closely with Dr. Ahmad Al-Absy, President of HTO, and Jalot Al-Absy, HTO’s Director and Quality Manager, Deli Halal is constantly using the high standards of halal certification in the pursuit of excellence at every stage of food production. From the farm to your local grocer, Deli Halal ensures that only halal-certified ingredients and processes are used every step of the way. Our All Natural Turkey Breast, Rotisserie Chicken Breast, and Roast Beef are nitrite-free. Our goal is to offer a completely nitrite-free line of products in the future. So when you see the halal-certified stamp on a Deli Halal product, you can feel good about what you’re eating. That’s part of the Deli Halal promise. Deli Halal’s full line of halal-certified meats and cheeses is currently only available in select markets. Deli Halal plans to reach more markets in the near future, so to find the store nearest you that carries certified-halal products from Deli Halal, just use the simple store locator. If your local supermarket doesn’t carry Deli Halal products, you can ask your grocer for them by name. While Deli Halal products are currently only available at select locations, the company is committed to helping to #spreadthehalal to as many stores and communities as possible. You can help, too, by reaching out to Deli Halal on Facebook and Twitter or spreading the word about Deli Halal’s delicious halal-certified meats and cheeses! Sign up for the Deli Halal newsletter for future updates about promotions and where their products become available.